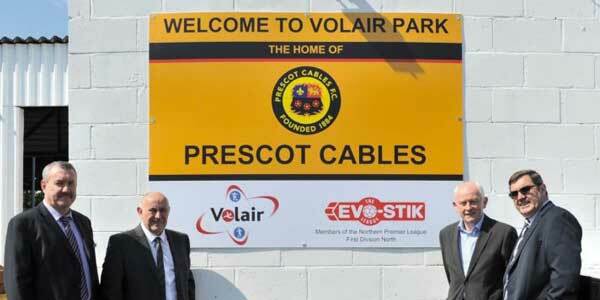 Prescot Cables Football Club have announced a multi-year partnership with Knowsley Council’s leisure provider Volair. As part of the deal Valerie Park, the club’s Hope Street home, will be renamed Volair Park, after its new sponsors. The deal will see both parties benefit from the partnership, with Prescot Cables 1st, Reserve and U18 teams training at the Volair Prescot Soccer Centre. Teams who participate in the Knowsley Junior Football Development League will have the opportunity to be mascots at Cables and will even have the chance to play on the pitch. Future plans include a football tournament to be staged at both the Prescot Soccer Centre and Volair Park, and Cables players getting involved with the football coaching sessions that Volair provide. Volair was founded by Knowsley Council earlier this year to run facilities such as gyms and swimming pools in the borough. Prescot Cables FC remains a supporters-owned club, and the recent announcement does not affect ownership of the ground itself.